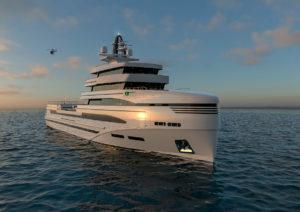 Following the announcement that Rosetti Superyachts SpA will start building large custom yachts at San Vitale shipyard in Italy (Ravenna), the new company has released details of its 85m expedition supply vessel concept designed by Tommaso Spadolini and developed in collaboration with Rolls-Royce Marine. “Another key consideration was that the project had to be buildable following design to market and design to service criteria,” says Fulvio Dodich, Chairman of Rosetti Superyachts. The concept is available in two versions with a fully certified helipad located amidships or aft, depending on client preference. Both configurations are rated at approximately 2,200GT and can carry large tenders on deck, but the aft helipad offers several practical advantages. A sailing yacht, for example, can be stowed amidships without adversely affecting helicopter operations. With minimal modifications to the design, the spacious salon under the helipad can also be replaced with a dedicated helicopter hangar. “Despite the abundance of exterior space, we arrived at a general arrangement that makes optimal use of the interior volume of the forward superstructure,” says Spadolini of the fivedeck layout. The lower deck comprises the galley, crew mess and lounge, and accommodation for 12 crew (the captain’s cabin is on the bridge deck). The main deck houses four double guest cabins with en-suite bathrooms, plus additional crew accommodation. The full-beam owner’s deck features an open-plan suite forward, His & Her bathrooms, walkin wardrobe, and aft dining room. The upper deck forward is also dedicated to the owner’s use with a private lounge, study and access to the open foredeck with pool. Another salon aft serves as a media room and/or sky lounge. The bridge deck provides maximum visibility, while the open-under lower deck with access to the engine room comprising workshop, laundry, cold/freezer room, dry store, linen store, garbage room and other technical areas. Large tenders are fundamental for expedition use and the portside garage on the lower deck has space for two tenders, plus various Personal Water Craft (the MOB tender is stowed in its own covered bay on the foredeck). To starboard there is a massage parlour, sauna, dressing room and bathroom connected by a corridor to the huge beach club aft with gym and fold-down platforms on both sides. The hull form has been developed by the naval architects at Rolls-Royce Marine in Norway for optimal efficiency and seaworthiness even in heavy weather. Special attention was focused on ensuring ‘dry’ cruising with a narrow entry, distinctive bow flair to reduce sea spray and a high main deck forward that is 12.5m above the waterline. Rosetti Superyachts further chose Rolls-Royce as the supplier for an integrated solution including engineering and equipment as the engines, power electric system and propulsion units. The initial proposal is for diesel-electric propulsion using four MTU 16V 4000 series engines (MTU is part of the Rolls-Royce Group) as diesel generators combined with Azipull by Rolls-Royce for a maximum speed of approx 20 knots and a cruising speed of approx 15 knots. In addition to low drag and high hydrodynamic efficiency, the azimuthing pulling propellers provide excellent maneuverability, fuel efficiency, course keeping, and low noise and vibration levels. To contain costs, owners can choose between a fully faired hull and superstructure, or a commercial-grade paint finish.